Maximize your performance on your next hunt with world-renowned, Nosler Trophy Grade ammunition. Ideal for elk, deer and other similarly sized game, these 7mm Remington Magnum rounds from Nosler feature a 140-grain AccuBond projectile, loaded into boxer-primed, noncorrosive reloadable brass cases. 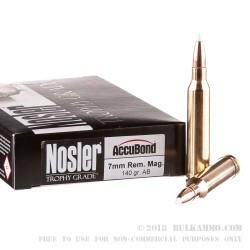 The AccuBond projectile features a polymer tip inside of a tapered copper alloy jacket and utilizes Solid Base technology at the rear of the bullet as a base for expansion. The AccuBond projectile also goes through a proprietary bonding process to prevent any jacket and core separation, ensuring maximal weight retention and expansion on impact. 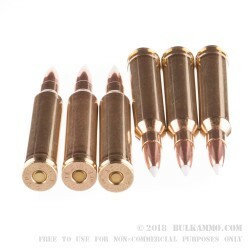 These 7mm Remington rounds are capable of a muzzle velocity of 3200 FPS and maintain a velocity of 2056 FPS at 500 yards. 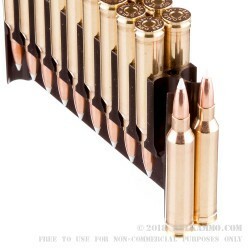 Each box of Nosler 7mm contains 20 rounds. 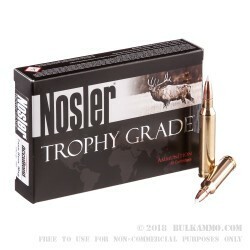 Since 1948, Nosler has created quality hunting ammunition for hunters, by hunters. After failing to take down a moose in 1946, John Nosler decided to create his own hunting round that would deliver the reliable performance that essential to a successful hunt. Eventually he succeeded with the release of the Partition and spawned the creation of some of the most effective and accurate ammunition of his generation. From their Solid Base line to the Customer Competition line, Nosler has the right round for any situation.